Though largely unknown, vitamin K is critical for our health. It is needed for the normal clotting of blood and for the formation and maintenance of healthy bones. Although vitamin K2-- also called menaquinone--is naturally produced by some of our intestinal bacteria, only a limited amount of this essential vitamin is stored in our bodies. A lack of this vitamin, which can be caused by a poor diet and the regular use of certain drugs such as antibiotics, is not uncommon. 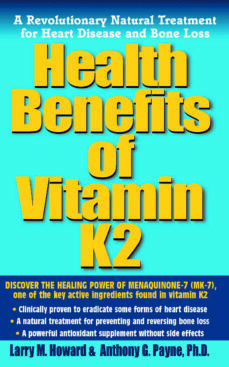 Now, a new supplemental form of vitamin K, specifically vitamin K2--menaquinone-7 (MK-7)--is becoming more widely available to health consumers. It is showing great promise as a natural treatment for heart disease and bone loss. Available in soy products and as a nutritional supplement, MK-7 is clinically proven to be safe and effective. It may also be helpful for lowering cholesterol levels, preventing Alzheimers disease, and treating some forms of cancer. And MK-7 is a powerful antioxidant without side effects.